If email is used appropriately and strategically, your business can continue to utilise this form of digital communication effectively. Your customers like to stay up-to-date, and to learn and engage with businesses they like. All of this can easily be accomplished with eDM video distribution. Marketers love email because it can easily be integrated with other campaign efforts. Running a video contest on social media? Promote it with email! Looking for customer testimonials? Ask for them through email. No matter what anyone tries to tell you, email is far from dead! You just need to be strategic in order to stand out in the inbox. That’s where we come in. Video and email are two important aspects of most marketing and internal communication campaigns, when you combine them for eDM video distribution, your customers and workforce will engage with you and become even greater brand advocates. Email is a cost-effective channel of communication for campaigns, welcome series emails, recruitment, OH&S, and periodic newsletters. eDM video distribution boosts monthly revenue by 40% (2) and decreases email opt-out rates! Customers and your workforce will love the more direct form of communication – Similar to SMS, email is sent directly to the user. Unlike social media, email is essentially a conversation between two people, not a giant post enabling endless comments and queries that may become lost in the feed. More people have email addresses than social media accounts (3), therefore there is a larger reach when you use eDM video distribution. Because everyone has access, people are generally more comfortable receiving communication for companies directly using email. Did you know, video in email can increase open rates by 19% (4) and click through rates by 62%? 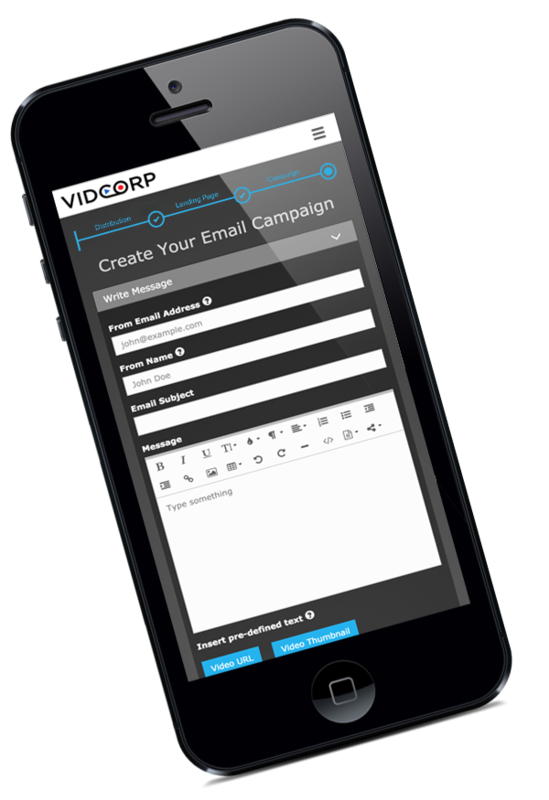 At VidCorp analytical data is stored and tracked for all email clients, making it easy for you to measure the success of you eDM video distribution campaigns. We know your company is unique. Simply providing a cookie-cutter platform isn’t enough! That’s why we offer fully customisable platforms with the ability to create personalised welcome emails, newsletters, reminders or any campaign you like. Change font colour, size and customise headings. Adding quotes, coupon code links, graphs and other formatting is simple and effective for branding. The use of email for business communication is not a dying art, but something that needs to be carefully tracked and strategised, and rejuvenated. By adding video and logo pages, VidCorp provides the platform to strengthen your marketing campaigns.